Monday the 26th we took off at 10am. (Right after our dinghy was fixed for the second time.) We sailed directly to Anegada – I got a bit nervous at the end as we didn’t see the channel markers right away. Anegada is surrounded by reef and there is only one channel in – if you don’t make it through the channel, you ground your boat. We ended up anchoring in only 10 feet of water! 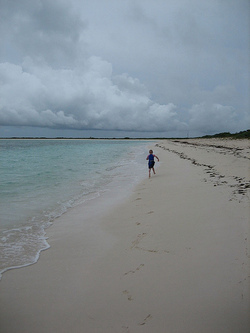 It rained most of the time we were in Anegada but we still had a fabulous time. The beaches were gorgeous, the snorkeling was good and the beach bars were fun! We stayed two nights. The first day we went to Loblolly Bay which was by far the more popular destination. Great snorkeling and an awesome beach. The next day we went to Cow Wreck beach which was even better. It was even more beautiful, there were only about five other people there – on a beach over a mile long!, and Belle who ran the beach bar and restaurant was a great cook and very friendly. It’s called Cow Wreck because a boat carrying a load of cattle crashed on the reef and their bones are still there. We didn’t see the cow bones but we did see a shark, a ray, and lots and lots of conch and crabs. Jacob put a live conch in his sand castle until Frank explained that it would die out of the water.